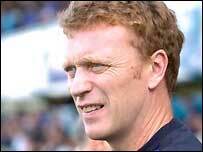 Everton manager David Moyes has signed a new contract that will keep him at Goodison Park until 2009. The 41-year-old Scot, who joined Everton from Preston in March 2002, has guided the Merseysiders to third place in the Premiership this season. Everton have been in talks with Moyes over a new deal, but he insisted he wanted assurances about future transfer funds before signing the contract. Moyes said: "I'm delighted and extremely humbled to receive it." He added: "I'm ever so pleased. The opportunity to sign a second contract at Everton doesn't come around very often, whoever you are. "But I would not have signed it if I did not have reassurances that there are funds available and we are moving in the right direction." "I realise a big part in me getting this is because the players have performed so well. Best news we have had in months - Moyes is the man to take us forward! "I also feel that we have made progress in the past two-and-a-half, three years and I know see a much better future for Everton. "That is making me think that it is certainly the right place for me to put my name to. "We have got new funds coming in and with that I feel there is a chance to move the club on to the next level." Everton chairman Kenwright said: "I am thrilled that David has decided to pledge his future to Everton and am absolutely certain that Evertonians all over the world will be similarly excited. "Since his arrival at Goodison Park, David has proved himself to be one of the most gifted young managers of his generation."